Hebrews 9: 21-22 21 Moreover he sprinkled with blood both the tabernacle, and all the vessels of the ministry.22 And almost all things are by the law purged with blood; and without shedding of blood is no remission. This story, from the very first book of the Bible, shows the contrast between those who think they can earn their way into heaven, or work out their own salvation, and those who trust completely in the finished work of Jesus on the cross. 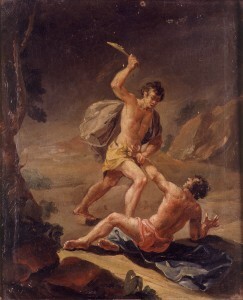 Notice that Cain became so angry at Abel that he slew him. It enraged Cain to think that all his hard work was disrespected, and Abel found respect with God, by simply shedding the blood of a lamb of his flock. This is true even to this day. It angers people to think God would exclude a person from eternal salvation who has many good works to their credit, and include someone who looks to Jesus for their righteousness and salvation. Galatians 4: 28-29 28 Now we, brethren, as Isaac was, are the children of promise.29 But as then he that was born after the flesh persecuted him that was born after the Spirit, even so it is now. Good works do not earn a place for us in Heaven. Ephesians 2: 8-9 8 For by grace are ye saved through faith; and that not of yourselves: it is the gift of God:9 Not of works, lest any man should boast. There will be no boasting before God in Heaven. This angered Cain and continues to anger people to this very day. But this is truly the Good New’s of the Gospel of Christ. You do not want to be under the law, working to try and meet the standards of a perfect and holy creator. If we measure our self this way we will always come up short, and be angry that we are unable in this life, to live up to the standard of God. ← Does God reward our good behavior, and punish our bad behavior?